‘What was that number again? Oh hang on, I’ll get a pen. Wait, I have nothing to write it down on, hang on a minute’. I’m sure this is an extremely familiar scenario for anyone who has ever worked in a business environment. You just need to remember that one vital contact but you can’t for the life you think where you wrote it down. What you need is a notepad. At Kaizen, we offer notepads for a variety of uses, from taking down a name or a phone number on our A6 booklets to writing up a customer enquiry on our A2 desk pad, we have the perfect size and style to fit your needs. But with technology at the point it’s at right now, is there a need for your notes to be on paper? Everyone has a laptop, a phone or a tablet now, all of which can take down notes in a much more presentable way. So why the need for notepads? Well, apart from being really useful for when you just need to jot something down quickly, they can also be a nice little marketing tool. Give them out as a gift at a conference or a complimentary item and suddenly customers and clients have something with your logo on it taking pride of place on a desk at their office. But what size is best for you? Well as we said earlier, our A6 size pads are perfect if you just need to jot down a name or phone number, but if you need something a little bigger then our A5 or A4 sizes are a perfect fit. Our A5 sizes can be printed with squared or lined pages for a more professional look and are perfect for external marketing or internal use. Our A4 pads are really useful for taking down client or customer orders over the phone. At Kaizen we ourselves use A4 pads for this purpose and with a durable hard back base, they are built to last. However, if you need something a bit bigger, then our A3 or A2 desk pads are ideal. Maybe you need to sketch an idea down quickly or turn them into desktop calendars. Perhaps you’re timetabling the day. Whatever the reason, our large desk pads are exactly what you need. They’re both printed on our 120gsm uncoated paper and come with a heavy backing card so they are robust enough for any use. 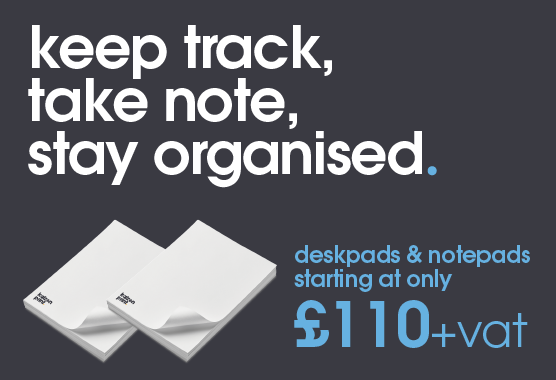 With 100 sheets per pad, you won’t run out quickly either, so they are even better value. All of our notepads are available in quantities ranging from 20 up to 100 and can have logos and/or designs printed in full colour wherever you like on the page. If you need them for use internally or for a little bit of external marketing for a slight edge over the competition, then give Kaizen a call today.